TOPPS trading cards, which has been a partner of Major League Baseball and the Major League Baseball Players Association for decades, is no longer using two logos which are considered offensive on the company’s baseball cards. Neither the Cleveland Indians’ Chief Wahoo logo nor the Atlanta Braves screaming Indian are on TOPPS retro card offerings that are available to consumers. Instead there are alternate logos. The Atlanta ownership group under Ted Turner discarded the screaming Indian logo in 1989. With Turner long gone, a different Braves ownership group tried to bring back the discarded logo to use on various merchandise in 2013. When word leaked out that the logo was part of the team’s 2013 branding effort, the ownership reversed course. The TOPPS retro cards show today’s players in the designs of 1950s and 1960s baseball cards. The two offensive logos on the cards were prominent decades ago. Major League Baseball through Commissioner Rob Manfred would like to de-emphasize the Chief Wahoo logo. But the Dolan family – Indians ownership – has been slow to react and decommission the logo. It is unclear if MLB was behind the TOPPS action. TOPPS no longer has the licensing rights to print National Football League cards so there will not be any revisions to the Washington players’ cards in any form. Panini, which has the football card license with the NFL and National Football League Players Association, has released 2017 cards and the Washington logo and name are featured. 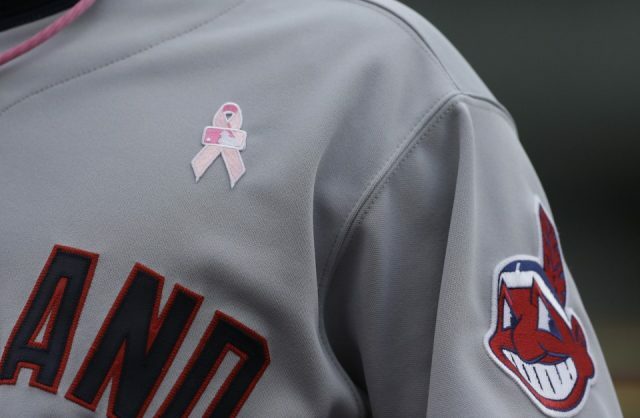 Major League Baseball is not forcing the Cleveland or Atlanta ownerships to drop their names. The University of North Dakota gave up the Fighting Sioux name after asking local Native American groups for approval. One tribe refused. The NCAA has forced college teams to drop offensive names if Native American tribes object to them.